For years, United States has led the world on microgrid development. But now, the world is catching up as communities turn toward microgrids as a way to shore up grid reliability and integrate more renewables. 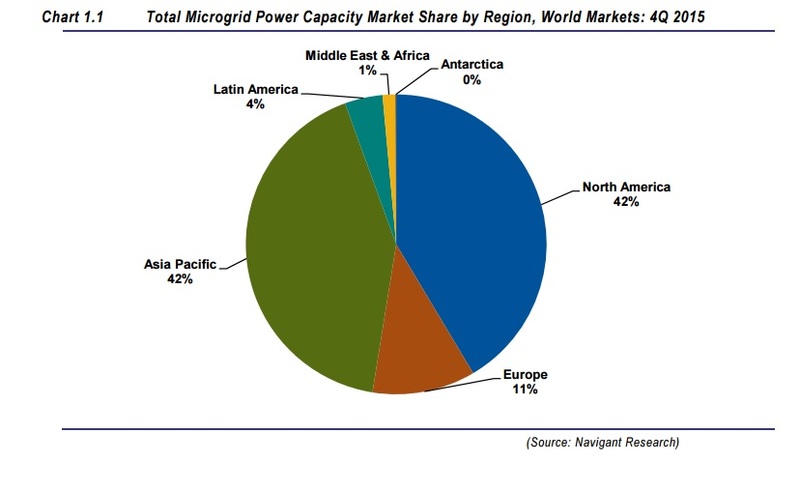 Navigant has issued its Microgrid Deployment Tracker for the fourth quarter, finding 1,437 projects worldwide, representing 13.4 GW of capacity. Those projects could be operating or in development, and when you compare the numbers to year’s past the increase is sharp: Three years ago, Navigant had identified just 3.2 GW of total microgrid capacity. But beyond the four-fold increase in capacity, what stands out is the dramatic change in market share. In 2012, the U.S. had more than 2 GW of the total, about two thirds of worldwide capacity. Europe had an estimated 384 MW of capacity and Asia Pacific just 303 MW. Now? Asia Pacific has more capacity in the microgrid pipeline than the United States, while Europe’s share has remained fairly constant. “Asia Pacific is catching to the United States, and over the long run is actually probably the biggest market,” said Peter Asmus, principal research analyst with Navigant Research. Though it’s basically a dead heat, the firm attributes 5,620 MW to Asia Pacific and 5,554.8 MW to the U.S.
Much of the Asia Pacific growth is made up of remote microgrids in developing areas – oftentimes diesel generation systems where renewables are being added. But Asmus also notes that much of the microgrid growth in Japan will be grid connected as the country continues to rethink its utility industry in the wake of the Fukishima nuclear disaster. Pulling out large destructive events, Minnesota researchers have estimated Japanese power outages at four minutes each year compared with about an hour and a half in the U.S. Midwest and more than three hours in the Northwest. For your average grid-connected residential customer, that’s an annoyance but perhaps not earth shattering. But microgrids are typically installed in instances where reliability is vital – either economically or for survival. “It’s more of an issue for the digital economy,” Asmus said, pointing to large users like data and cloud storage who may need the famed Five 9s reliability standard (up and running 99.999% of the time). “Businesses that do rely on ultra-high reliability, those are the businesses that have the load to make it economic,” he said. Much of the growth in Navigant’s numbers are coming from remote systems, totally disconnected from the grid and often times geographically on the fringe. The firm said remote microgrids now make up half of all systems deployed globally, and the new numbers incorporate a portfolio of projects near the Arctic Circle in Russia, totaling 816 MW. While the numbers are strong, it’s tough to get a sense of how quickly the segment is growing. Asmus explained that islanded microgrids are simply difficult to find. Undercounted, but easier to understand and generate revenue from, Asmus said. “You don’t have the luxury of a grid-connected system where something fails and it’s no big deal,” Asmus said. There are microgrids being developed all across the United States, but two regions are especially strong: California, and much of the eastern seaboard north of Washington, D.C. Navigant’s figures now include 83 proposed systems which received funding from New York to complete feasibility studies, a part of the state’s Reforming the Energy Vision strategy. “New York is definitely of one of the main markets in the US but it’s certainly not the only market,” Asmus said. Connecticut, New Jersey, Maryland and the District of Columbia all have initiatives in place to support microgrids, and Rhode Island is considering one as well. Over the summer, New York awarded $100,000 to communities proposing microgrids in order to boost grid resiliency. Called the “NY Prize” and administered by the New York State Energy Research and Development Authority, the strategy initially targeted up to 30 projects but wound up funding almost triple that number of feasibility studies. Capacity numbers are not attached to the projects yet, so they only show up in Navigant’s project count. But Asmus said he believes most of them will eventually be developed, either through state funding or private partnerships. Feasibility studies are expected to be completed in February, and the second phase will award up to $1 million to 10 projects. And utilities are working quickly to get in on the game, said Asmus, both partnering on projects and analyzing how they will effect their service territory.